Labyrinth is a major fantasy feature film with a cast of incredible creatures created by The Jim Henson Creature Shop, and produced by Star Wars director George Lucas. Starring rock legend David Bowie, who performes five original songs, Labyrinth is the perfect family film combining music, adventure, comedy and fantasy. 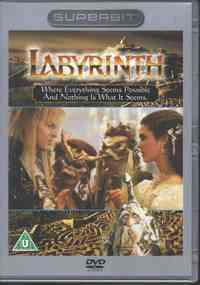 Frustrated with baby-sitting on yet another weekend night, Sarah - a teenager with an active imagination - summons the Goblins from het favourite book, "Labyrinth", to take her baby step-mother away. When little Toby actually disappears, Sarah must follow him into the world of her fairy tale to resque him from the wicked Goblin King (Bowie)! Guarding the King's castle is The Labyrinth itself - a twisted maze of deception, populated with outrageous characters and unknown dangers. To get through it in time to save Toby, Sarah will have to outwit the King by befriending the very Goblins who protect him, in hope that their loyalty isn't just another illusion in a place where nothing is as it seems!